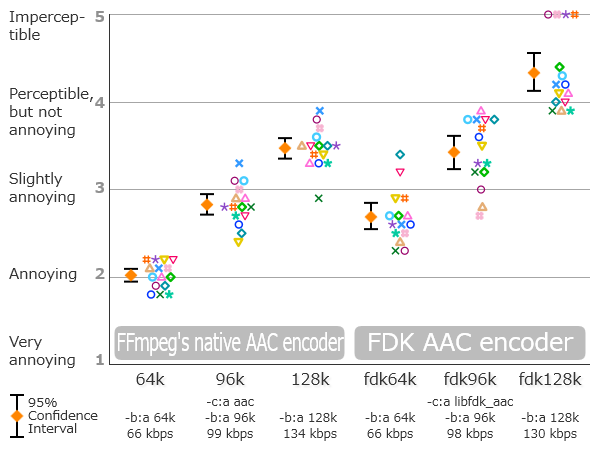 Blind sound quality comparison between the FFmpeg's native AAC encoder (-c:a aac, from the 2016/01/17 version) and the Fraunhofer FDK AAC encoder library(-c:a libfdk_aac), at 64 kbps, 96 kbps and 128kbps. The FDK-AAC was the clear winner. Compared to 2016/01/17 version of the FFmpeg's native encoder, Fraunhofer's FDK-AAC library delivered the same sound quality at 32kbps reduced bitrates. 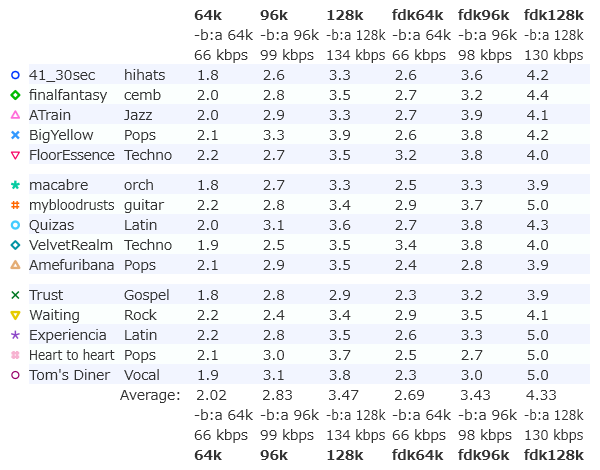 The FDK AAC tend to have less bitrate deviations. The unit is in bps. For AAC-LC the likely answer is: Native FFmpeg AAC encoder (aac) >= libfdk_aac > libfaac. That statement is likely to be overstated. I also read some people suggesting that the ffmpeg implementation sounds as good or better than fdk ... which is clearly nonsense. The encoder is transparent at 128kbps for most samples tested with artifacts only appearing in extreme cases. Subjective quality tests put the encoder to be of equal or greater quality than most of the other encoders available to the public. Oh right, yeah I guess that's the case. Sheesh, even open source needs to do some marketing I guess. Are there someone still working on aac codec of ffmpeg? They may get some ideas/theories on how to improve the performance of the encoder based on listening test like this. NOTE: as of 2017 this is no longer necessarily the case. The built in aac encoder is quite good. Do you happen to know, Kamedo2, how the native encoder of today fares against FDK-AAC? Development of codec takes years. ffmpeg AAC was far inferior to FDK. You can't change it in 1 year. Even not 2 o 3 years considering how many projects ffmpeg has. Let alone an idea to compare it to such encoders as Apple or Fraunhofer (Winamp edition) AAC. It hadn't change during several past years and it won't in next years. The rest is a lie. You are proved to be liar. 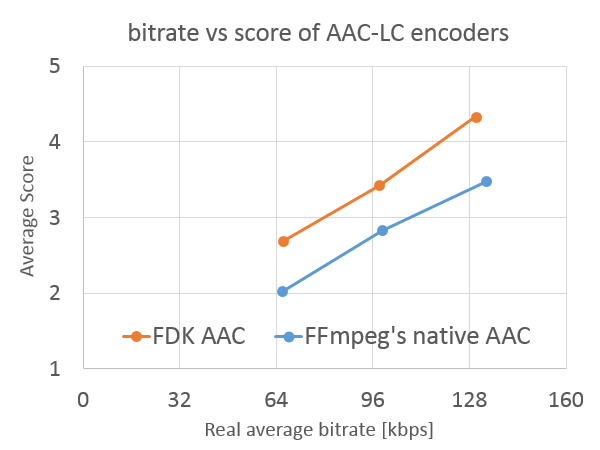 OP has provided detailed data of a listening test that shows that FDK-ACC is superior to FFmpeg's AAC encoder, despite the latter having been improved in 2016. FFmpeg has provided no such data to back up their claim that their encoder is superior.